This year marks 17 years since the terrorist attacks that claimed the lives of thousands of Americans, including members of CWA, NABET-CWA, and AFA-CWA. Our members were doing their jobs, on planes and on the ground at the World Trade Center in New York City, the Pentagon in Washington, D.C., and in Shanksville, Pa. On September 11, and every day, we honor their memory. 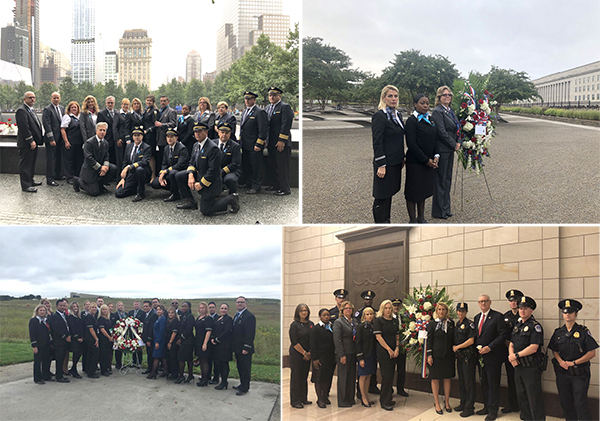 To honor the memory of those who lost their lives on September 11, 2001, the AFA-CWA's third annual Honor Guard attended services at our nation's three September 11 memorials in New York, Washington, and Shanksville.